March 30 2015. The day Trevor Noah was inducted into the league of American late-night talk show hosts. Diarise it. March 30 2015. Where were you on this day? What did you tweet when you heard the news? The news that he will be given the responsibility of presenting The Daily Show when Jon Stewart retires at the end of the year is extraordinary. His progress in the last decade or so has been astonishing. From being a regular on SABC 3’s Isidingo to becoming a local household name with a string of successful stand-up DVDs, Noah is now an international act. He was the first South African to appear on Late Show with David Letterman and The Tonight Show with Jay Leno. He’s even a name in UK, having done a stand-up set on Live at the Apollo and featured as a panellist on QI. Noah is no stranger to hosting talk shows. 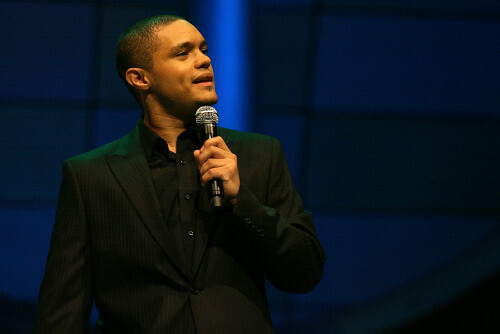 In 2010, Tonight with Trevor Noah came and went with a simper, lasting only 26 episodes. The failure of Tonight is not, however, to be taken as damning. Noah is equipped with an immovable confidence and a brand of clever observational humour, very much in keeping with that of the popular late-night talk show culture in the US. In spirit, the appointment of Noah is pleasingly apposite. Stewart’s leftist stance, which provided the antidote to conservative contemporaries like Bill O’ Reilly, will be easily and naturally picked up and built upon by Noah. Noah’s stand-ups take jibes at different cultures in a way that refreshingly lacks the degree of the malice-masquerading-as-banter of today’s comedy, which, in its comfort with offence, often forgets to chuck in the wit. Indeed, Noah’s comedic repertoire will need to be expanded for the undertaking. The Daily Show will require a much pithier, punchier political satire that is far from the accent-based, long-form jokes Noah is famous for. Research done by Pew says 45% of those in the US that consider themselves consistent liberals trust opinions expressed on The Daily Show, while 34% of them say it’s where they get their political and governmental news. It also attracts the youngest viewers — average age 34 — of all the TV news programmes in the US. As one who is interested in representations (seen in his stand-up and as shown in the few segments he has had on the show), Noah has the opportunity to be the figurehead and somewhat of an influence on what is a young and presumably intellectually dynamic audience. Even more is that Noah will be able to do this in what is a white, male-dominated arena. Noah also has a chance to present a show that expands news coverage on these kinds of shows. One doubts that he will he completely migrate his focus onto American-centred politics. Who could have predicted Noah would come so far in such a short time? From the contagious gags on Crazy Normal, Noah has clearly matured into someone who is seen to have immense potential from very important people. He has been trusted to be the one that young liberals look to, who can provide an additional layer to The Daily Show’s established forward-thinking attitude, and the one who can pick up the mantle of Stewarts’ effortless grace. Exactly how things will pan out from here is obviously still up in the air. How much creative control will Noah have? Will the show remain as it is with a simple host substitution, or will he be able to stamp his authority? And how will the Americans — and indeed others — take to Noah? Taking over a dynasty that has lasted 16 years will prove daunting, but will also be a fine platform to strut his stuff and become South Africa’s greatest ever export.